Even though most traditional heavy metal music from Southern Europe comes from Italy, Spain shows with Angrist that they are just as good at doing retro metal. Angrist, who took their name from a character of the non-readable Lord Of The Rings prequel Silmarillion, sound as if they came straight from the late Eighties. After a disposable intro, the EP starts with two fast songs that owe as much to early Iron Maiden as to the first wave of American speed metal bands. The two guitars are giving each other ample opportunity for interesting duels, whereas drum and bass convince with technical but always concise rhythm work. Especially the bass player must have been heavily inspired by Steve Harris, which is only meant as a compliment here. The vocals are clean and high, without relying on effects, so that everything sounds very basic and down to earth, as if you were watching the band in their rehearsal room. The middle song Awakenings somewhat loses drive, being a not too well worked out half-ballad, before the longer Angrist (the album's highlight) and Cyanide close a very promising debut. 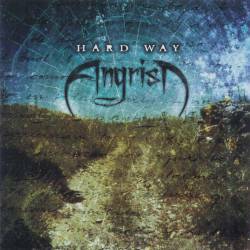 Hard Way never sounds like a high end heavy metal production, but that's where a part of the charm comes from. The other part comes from the natural attitude the musicians have towards the style they are playing. Never trying to reinvent heavy metal, they feel at ease delivering melodic speed metal songs as they were popular nearly twenty years ago. And if one day the band decided to make their website more accessible by offering also an English version, they have good chances to become well known beyond their Iberian peninsula. Until then, you should try to grab up as much Spanish as you can if you feel like wanting this record.